We only have two weeks of school left. It’s going to fly by like a bat out of . . . heck. 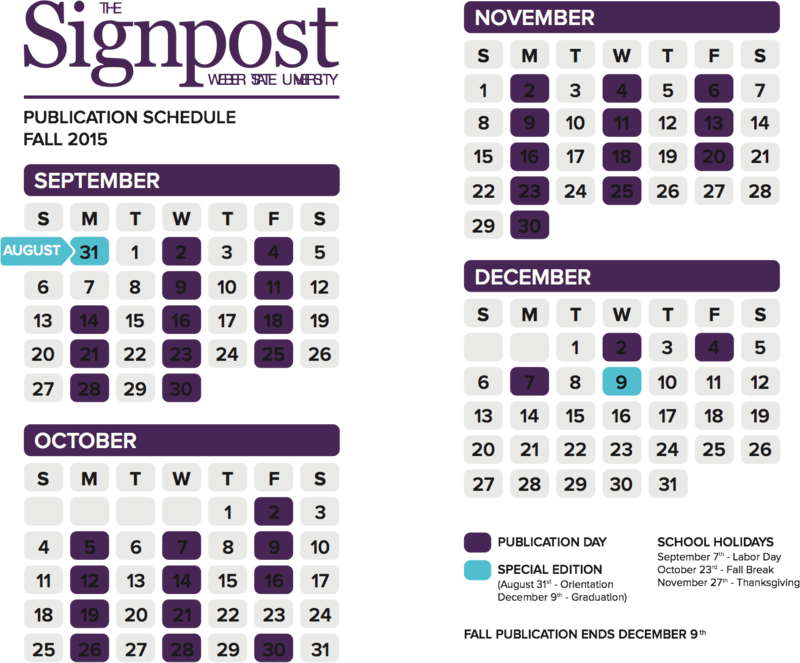 Because our time is limited, The Signpost would like to offer you some “finish the semester strong” pointers. Because time is limited, stop putting off all the big projects and little assignments that need to get done. If you have a big project due at the end of next week or during finals week, start working on it now. Work on it in chunks. Make time to work on a piece of the assignment every night. Pace yourself, and by the time it’s due you will be done and ready to go. By doing so, the workload the last week will be much less. This can apply to the 20-page paper or the big term video project. Whatever the case is, DON’T PROCRASTINATE. We all would rather be outside enjoying the spring weather, hanging with friends, seeing a movie, watching baseball, reading a book for fun, or working than stressing about finals and homework. We believe that it’s possible to get everything done and not completely lose your mind in the process. Schoolwork needs to come first. If you put your schoolwork first every day, even if it’s only for an hour, then do something else for a while, that’s OK. But make sure you do something school-related for a little each day. Make schoolwork come first and plan accordingly. You don’t have to forgo all those much more enjoyable things than schoolwork, but manage your time well so that everything will fit in and you won’t be too stressed. Take the time to treat yourself. Students work hard to finish out school, so reward yourself at least twice a week with your favorite treat (twice is the minimum it’s allowed; it’s understandable if you need it more than twice). Eat an ice cream. Eat popcorn. Load up on candy and junk food. Drink a Coke or Mountain Dew or Red Bull or Gatorade. Whatever suites your fancy. It’s not the healthiest thing in the world, but it will make you happy and help you get through the workload you have. Also, plan time for fun. Make sure you have that moment in the day where it’s fun for you. It’s a good outlet to forget about the responsibilities and have fun. Warning: don’t get so caught up in fun you forget about those responsibilities. It’s been known to happen and can be detrimental. You might have put off a few assignments earlier in the semester. You might be looking for extra-credit opportunities. You might not have a clue as to what the teacher is talking about. Now is the time to make an appointment with your teacher, sit down and have a one-on-one with them. Ask about anything you need help with. Teachers want you to succeed, so if you are struggling with anything at all that has to do with their class or you know they can help you on, don’t be afraid to ask for help. Look at each day with a bright attitude. It might be hard because everything you have going is overwhelming. Just know there might be someone out there who has it worse than you do and just keep on trucking. The end is near and you can make it. The staff would like to wish you luck for the next two weeks. It is going to be a bumpy ride with lots of highs and lows. Just remember, you are definitely not alone in all of this. There are about 25,000 other students at WSU going through the exact same thing. Be positive, manage your time wisely, don’t forget to have some fun, finish strong and keep moving forward. The end is in sight.